The copy you use in your call-to-action (CTA) is just as important as the shape, size, and color of the button. 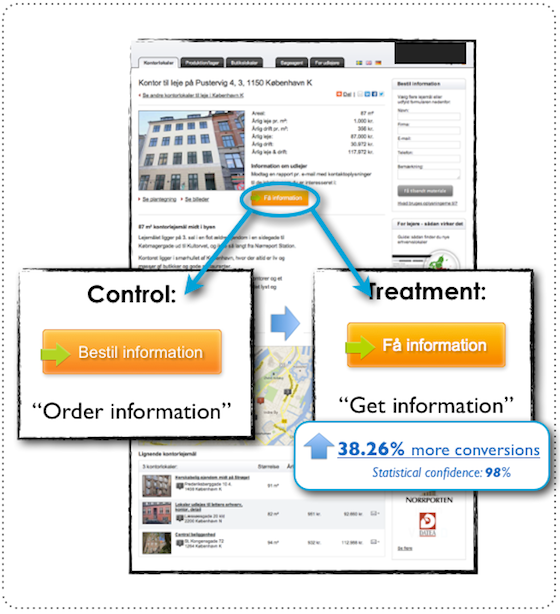 Even minor changes can have significant impact on your conversion rate. This guide, packed with case studies, examples, and simple optimization principles, will teach you exactly how to write calls-to-action that convert. 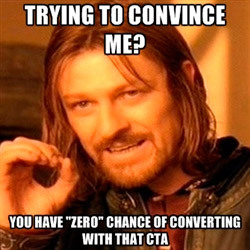 For some extra inspiration, check out “When CTA’s Attack: 10 Real-World Call To Action Examples“. 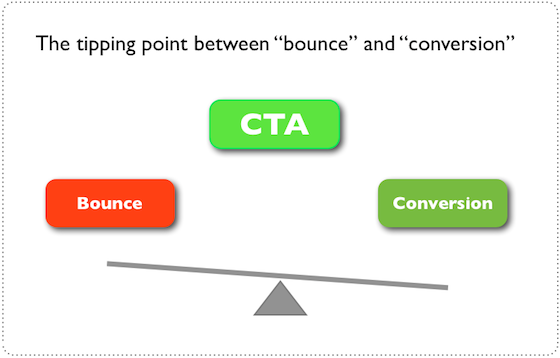 Your call-to-action represents the tipping point between bounce and conversion. When you ask someone to do something online, they have to go through your call-to-action in order to do it – regardless of whether you’re asking them to download a PDF, fill out a form, buy a product, or even just click through to another page. Shape and color are important visual cues that help attract prospects’ attention to the placement of the button. But in that last critical moment, when the prospect has to make up her mind, the copy itself is what she’s going to interact with. Tweaking a bit of button copy is a minor change on the page as a whole. However, it has major impact on the decision-making process of your potential customers and thereby also your conversions rate. Here’s an example from a case study where changing one word in the call-to-action on a B2B site generated a 38.26% lift in conversions. The client has a portal through which businesses can find offices for rent. The site features thousands of offices that potential customers can browse through. Once a prospect finds a relevant office, they have to click to the main call-to-action (located on all pages) in order to get more information on the lease sent via email. This means that clicking the CTA is a mission critical conversion goal, and every extra click potentially means money in the bank. The answer lies in the messaging. “Order” emphasizes what you have to do – not what you’re going to receive. Whereas “Get” emphasizes what you’re going to receive – rather than what you have to do to get it. In other words, the treatment copy conveys value. But conveying value isn’t always enough. To get the full effect, your button copy should also to be relevant to the specific conversion scenario the prospect finds herself in, when she has to click the button. In order to illustrate this point, let’s look at a case study, where a call-to-action that conveyed only value, performed significantly worse than a button that conveyed both value and relevance. 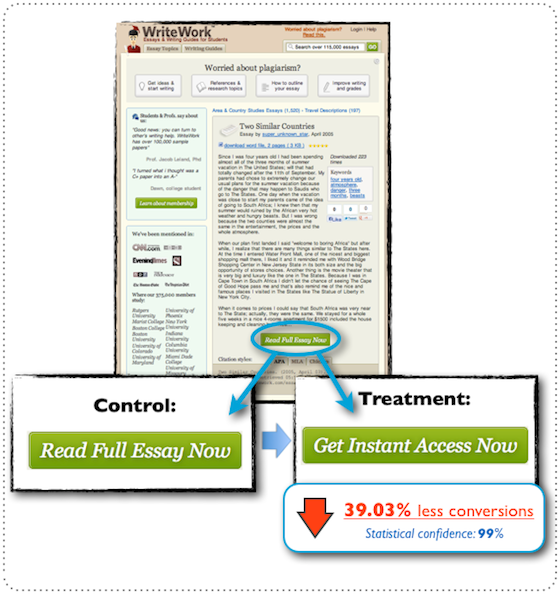 Despite the fact that “Get Instant Access Now” conveys value (It could have said “Buy access”), it is super generic compared to “Read Full Essay Now”. This call-to-action is located across 120.000+ landing pages, so getting it right is paramount to the overall conversion rate of the site. Here’s another case study that shows how adding relevance to a call-to-action can have a dramatic effect on conversions – in this case a 68% lift. The client has asked to be anonymous, but I can tell you that it’s a major chain of gyms in Scandinavia. 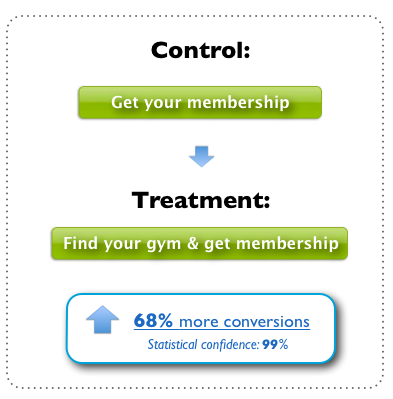 The example here is taken from a PPC landing page, where the goal is to get potential customers to click through to the checkout flow where they can select a gym and sign up for a membership. The control version is already pretty good because it conveys value and focuses on what you’re going to get – not what you have to do to get it. Nevertheless, it is very generic, “Get membership” could pretty much apply to any situation that has something to do with a membership. I did a little research and found out that the location is a very important factor, when deciding on a membership. So, in this case I could make the call-to-action more relevant to the specific conversion scenario and increase conversions by adding “Find gym” (Step 1 in the checkout flow features a complete list of gym locations). The case studies in this article are only a few out of multitude of button tests I’ve conducted over the last 4 years. However, they are very representative of the results I see again and again. It’s really that simple; the more value and relevance you can convey via your call-to-action copy, the more conversions you are likely to get. It is, of course, important not to disappoint your potential clients by making outrageous claims you can’t support. So keep your copy relevant and focused on the benefit of clicking – but don’t over-exaggerate. Review your website and look for calls-to-action where the button copy is either a generic order like “DOWNLOAD” and “SUBMIT” or something negative like “BUY NOW” that emphasizes what you have to do instead of what you’re going to get. The answers to those 2 questions are going to be the basis for the new button copy. You’ll of course have to spend time tweaking and refining it, before it’s ready for testing, but asking these questions is a great way to get started. The prospects’ motivation is to get a membership in a local gym. When they click the button, they’ll get the opportunity to find a gym and buy their membership. 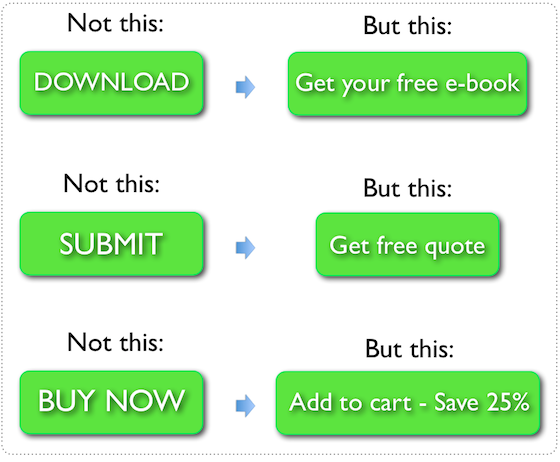 So, now you have the complete guide to writing a calls-to-action that converts, it’s time to start optimizing. But remember – always be testing! It’s the only way to make sure that you are in fact getting positive lifts from the changes you make.